Ben Affleck as CIA agent Tony Mendez. Argo opens with a glib lesson in shoddy Hollywood political objectivity, attempting to tell us that the geopolitical situation of Iran during the American Embassy hostage siege had its demonic seeds in the history of American interventionism. It is one of the few moments in the entire film that we witness a fleeting, if not grudging, attempt at political introspection. Ben Affleck’s latest directorial venture removes him from the geographical comforts of Boston but does political necessarily indicate a growing up in Hollywood cinema? It certainly has been the case with previous liberally inclined film stars turned directors such as Robert Redford and George Clooney. This growing up from traditional Hollywood film genres to more obscure, difficult and problematic material seems to mark some kind of a painfully superficial transition from an isolationist view of American life to broader transnational politics. Yet the sanitised liberal intentions including the serious subject matter, political context, 1970s period, extended conversation sequences and mixing of visual styles merely propagates a view that the ideological construction of such materials is what makes Argo a historically accurate representation of what is a true story. The problem that many of these so-called Hollywood political thrillers face is that by suppressing accurate and fair political content and context, those doing the re-presenting, namely Americans, engineer a historically biased discourse framed against current anti-Iranian sentiments that are regularly propagated by much of the benign mainstream media. No filmmaker has an obligation to be objective but surely every filmmaker has an obligation to be responsible in the way they represent a nation that is already undergoing a steady process of demonization by the western media. Argo fails on a number of political accounts, misrepresenting Iran and the Islamic revolution through a distant gaze that refuses to give the Iranian people an authentic or credible voice and instead disembodies them so their rage merges with familiar news imagery of state repression, executions, fanaticism and religious ideology. The Islamic revolution was a populist one and had widespread support amongst ordinary Iranians yet in the film, Khomeini and the new establishment are viewed with suspicion, derision and contempt by the American liberal gaze. Additionally, the refusal to fully explain the context of the Iran hostage crisis and what the Americans were actually doing in the Embassy smacks of selective amnesia. The mere suggestion of the Americans acting as spies in the Embassy is ridiculed and quickly rendered obsolete. However, by having the Iranians adopt this point of view makes them appear doubly paranoid and simply chasing a blood lust. In Rambo: First Blood Part II, John Rambo’s rescuing of POWs from a communist prison camp not only resurrected the spectre of the Vietnam War but his total annihilation of the landscape and its people saw a fictional re-enactment of having won a war America had lost. Such fantasy wish fulfilment resurfaces in Argo. The covert rescue operation mounted with the approval of Jimmy Carter in 1980 resulted in failure, resulting in the deaths of eight Americans and one Iranian. 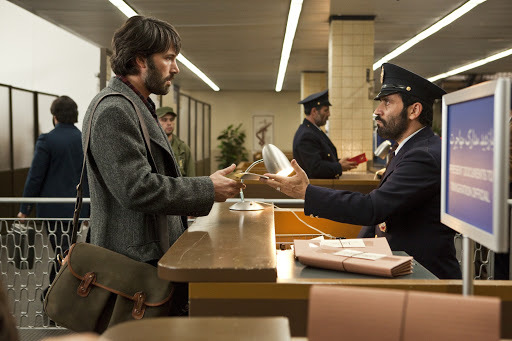 A film like Argo helps to conceal such political failures of the past, reconstituting American history and its humanist people working for the most morally deplorable of institutions (The CIA) as triumphalist, heroic and somewhat more liberal than those pesky gun totting incomprehensible Iranians. Even more worrying are the final titles, juxtaposing real photos of the event against stills taken from the film so that any questions to do with the truth, reality and authenticity are rendered almost invisible to the ordinary spectator. One leaves the cinema with the message that this is an accurate representation of a true story and categorically stating that Americans and the West are the good guys. But are we really? This entry was posted on November 10, 2012 by Omar Ahmed in 1970s, Genre, Historical, Hollywood Cinema, Political Cinema, Thriller.